Most people do nothing. If they sign on, they won't show. If they pledge money, they won't pay. If you hire them, they'll sit in their cubicle and sip coffee. You know how most soldiers never actually shoot at people? How as few as 30% perform all the kills? I've decided that this isn't a saving grace of humanistic morality. It's just another example of how most people do nothing. I'm not saying they're lazy. I'm not saying they're liars or deadbeats. Just that they do nothing. Most people do nothing. I think of them as the Zombie Army. It used to drive me crazy, until I recognized that loads of people buy gym memberships and never go to the gym. They buy French language tapes, and never play them. They truly want to do these things, and believe they will! So it's not a matter of contemptuous irresponsibility; it's just an inability to steer their own ship. That's why most people do nothing. Shoot, I myself have a plethora of books I haven't read, CDs I haven't listened to, and DVDs I never watched. I have literally 18,000 to-do items sitting in queue. I'm in this army too, I suppose. I justify my frozen queues by the knowledge that I sometimes do something, and those somethings have added up over the long run. But everyone has a list of compiled somethings, even the coffee-sippers and non-shooters. Every zombie can offer up an accounting of actions and achievements upon request. It's confusing. It makes my head hurt. But the practical upshot - the thing you can count on - is this: the thing you want them to do is the thing they won't do. Even if they'd like to. Even if they really meant it when they claimed to be spunkily "all in". Most will do nothing. I've developed a technique to cope with this. I call it the Zombie Filter. Whenever I find myself poised to sink hope and trust in a person, I give them a trivial task, knowing non-doers will reveal themselves by not doing. If I need to hire someone, I'll pay scant heed to their resume - the list of accomplishments every zombie is able to produce. But I'll offer them a solid page of vitally important reading material, and I will embed an instruction, ala "Send me an email with the phrase 'Rice Chex' in the body". A very low percentage will notice the direction and actually do it (and, of them, most will do it wrong; they'll make 'Rice Chex' the subject title and send a blank email, or they'll send an email explaining that they're following instructions, but they'll omit 'Rice Chex' entirely). Zombies filtered! New people I meet often ask for tips, particularly food. They'll ask me to follow up via email, and while I used to take their contact info, and fire off emails, as promised, I found that the vast majority never so much as read the email. So now I give people my contact info, and ask them to contact me and remind me to give them the info. The requirement of doing something is a deal killer. It's like zombie judo; using their torpor to my advantage. If you don't filter the zombies, you will curse yourself to endless recurring frustration. The zombie army will wear you down. They will annihilate you and they will absorb you, turning you into a black hole for everyone else's hopes and trust. Compounding the problem, even non-zombies infantilize in the presence of energetic competence. A long time ago I would throw birthday banquets in far-flung eateries. At my last one, once I'd wrangled a big crowd out of town and into the venue, seated them, ordered their food, explained the cuisine, and sparked conversations, I walked a platter of yum yums from guest to guest. I absolutely couldn't get them to reach for the tongs. No one budged. They just sat, staring helplessly, like weebles. Finally, I exploded. "Do I need to chew your food and regurgitate it down your damned throats, too?" There were no more banquets. 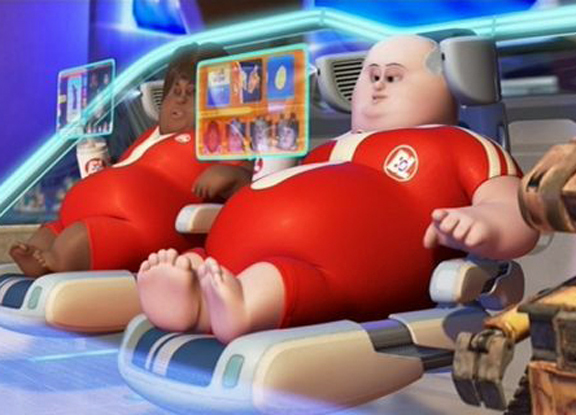 The Wall-E scenario is no longer futuristic. We have arrived. I was gonna post a comment really I was. j/k. Great post. Have you seen Inherit the Wind? Reminds me of the reporter dude. I served my time running an after school program at a daycare. For Chinese New Year I was the only one who did anything. I made a dragon head from aluminum foil and sequins Everyone who worked there criticized it. I finally added extra sequins and spent more time shaping the foil. The director said it looked much better it didn't really look like a dragon at all before. I just looked at her. It has been my experience that the zombies sit back and criticize every effort. I used to go to church and took pains to dress nicely. On sunday. All it got me was the side eyes. En masse. /Brains!!!!!!!!!!!!!!!! !